Felt Finger Puppet is very popular in Nepal Mithila Women Handicraft. Felt Finger Puppet is one of the best selling product for children. Although it is small it is very cute and attractive design of Nepal Mithila Women Handicraft. 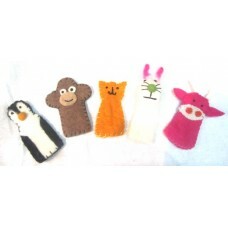 Felt Finger Puppet is available in various design like dog, cat, elephant, monkey, rabbit, etc. It is one of the most attractive products for children. We can also make your design of Finger Puppet if it is possible. Cat Finger Puppet is hand made product in Nepal Mithila Women Handicraft. It is 9.5 cm. It is made b.. It is one of the most attractive products for children. We can also make your design of Finger..
CockFinger Puppet is hand made product in Nepal Mithila Women Handicraft. It is 9.5 cm. It is made b..
Crocodile Finger Puppet is hand made product in Nepal Mithila Women Handicraft. It is 9.5 cm. It is ..
Dog Finger Puppet is hand made product in Nepal Mithila Women Handicraft. It is 9.5 cm. It is made b..
Doll Finger Puppet is hand made product in Nepal Mithila Women Handicraft. It is 9.5 cm. It is made ..
Doll finger puppet is a hand made product in our shop.It is 9.5 cm long.It is made from wool. Availa..
Hen Finger Puppet is hand made product in Nepal Mithila Women Handicraft. It is 9.5 cm. It is made b.. It is hand made product in Nepal Mithila Women Handicraft. It is 9.5 cm. It is made by wool.Availabl..
Man Finger Puppet is hand made product in Nepal Mithila Women Handicraft. It is 9.5 cm. It is made b.. It is a special set of mixed finger puppet. Its size ia as same as the others. Available in assorted.. It is a special set of mixed finger puppet. Its size ia as same as the oth..
Monkey Finger Puppet is hand made product in Nepal Mithila Women Handicraft. It is 9.5 cm. It is mad.. Mouse Finger Puppet is hand made product in Nepal Mithila Women Handicraft. It is 9.5 cm. It is made..
Penguine Finger Puppet is hand made product in Nepal Mithila Women Handicraft. It is 9.5 cm. It is m.. Pig Finger Puppet is hand made product in Nepal Mithila Women Handicraft. It is 9.5 cm. It is made b..
Rabbit Finger Puppet is hand made product in Nepal Mithila Women Handicraft. It is 9.5 cm long..